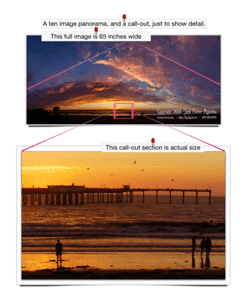 This is just a little piece of information about why I shoot multi image panoramas. …I could shoot this with a single image using a very wide angle lens, or I could use a longer lens and take multiple images, and then stitch them together. Detail. … The source image is a stitched set of ten images, five images per horizontal row. I shoot with a Canon 5D Mark II, whose RAW image width is about 5,600 pixels. … This combined RAW image has a width of 20,000 pixels, and a height of about 9,000 pixels. … In little words, “This image is way big.” That is what the image call-out is showing at the bottom of the image. Detail. … A little detail of the center of the combined image. If I had used a single wide angle image, my source would be only 5,600 pixels wide, not near as much detail in 5,600 pixels as 20,000 pixels. I like stitched multi-image panoramas because they can maintain the beauty of a great space, as seen from a distance, and simultaneously, you can get close and see all kinds of interesting stories in the same image. … 😉 Details. Last week I went to Tijuana, Baja California, México, with the Pacific Photographic Society, a Meetup group that generates great photo trips, also having the benefit that it is also full of friends.It was the first time I had been south of the border in many years, only because I had no specific need, or an opportunity to visit with friends that also wanted to go. What a hoot! The organizer of the group is my friend, and a fellow photographer, Walter Koenig. Thanks Walter. Now, onto the trip. Here in San Diego we are bombarded with so many negative stereotypes, and visions, of our neighbors just across the border that, when I mentioned to my nextdoor neighbor that I was heading south with a group, he said, “Don’t go.” We did not listen to the voices of preprogrammed fear. … We went, and we had a good time. 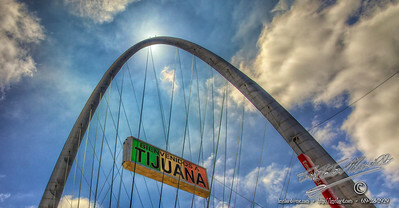 This is a link to my complete gallery of images from our Tijuana excursion. Louie Navaro, of George’s Camera, was our guide for the trip. Louie also has a gallery he shares with two other photographers in Tijuana. We walked across the border, and then met up with the van on the other side. First, we drove over to the Playas de Tijuana, where we shot some photos of the border, where it enters the ocean, and along the beach, and boardwalk. I met a young fighter, Ramon Barboza, El Moncho! … It was a very cool day at the beach. Later, I got separated from the group after we had wandered around for a little while in the downtown area of Tijuana, and Ave. Revolución. … I asked a few folks which way to San Diego, on foot, and they pointed me in the right direction. It was a pleasant walk, but damn! When I got to the border, the pedestrian line was over two hours long. Holy Mackerel, what a nightmare! Luckily for me, the rest of my group came wandering by while I was in line. They pulled me out, and we all took an eleven passenger van up to the border, where we used the bus line border transit, and that only took an hour and a few minutes!